Winterize Your Pipes - American Bath Remodeling Inc. Welcome back to the American Bath Remodeling blog! We’re deep into December and you know what that means! Yes, ok, first it does mean the holidays are right around the corner and the end of the year is here. That is all accurate, but it means something else for a lot of people throughout the country (and the globe!) It means the coldest days of winter are on our doorstep and if we don’t take the necessary precautions, we might find ourselves in a world of hurt we didn’t anticipate! As you know, here at Ambath our purpose and pride is bathroom remodeling. You know what can do a number on bathrooms (amongst others)? Winter weather. So, this time on the blog, we’re talking about how to winterize your pipes! 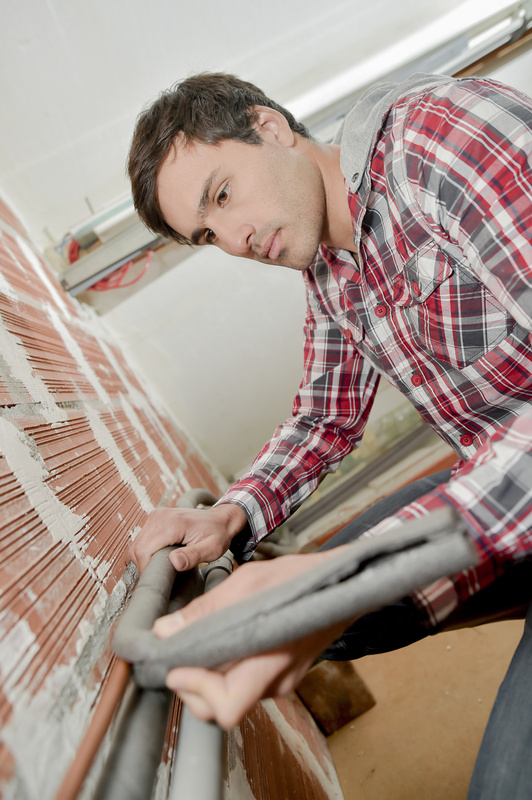 Keep in mind, winterizing your pipes is only necessary when a building is going to be vacant for some time. That sitting water will freeze in the cold and when it freezes it’ll expand and when that happens you might you’re not so happy with your exploded pipes. First things first, you are going to want to get started with a plan of some sort. It can be incredibly easy to miss a step when you just sit down and get to it so instead of opening up yourself to that error, take a breath and build a plan. Make a checklist of each part that needs work, the valves, the taps – everything. It’s a lot of work, we know, but when you complete it and you know you’re good to go, nothing will taste so sweet. Shut off the main valve. Turn off the water heater and pump. Open all the drain valves and taps. Use your list and check them all off as you go, ensuring that every tap is open. A closed tap is no good, it can create a vacuum that will hold some water inside the pipes somewhere. Keep these open throughout the winter. Use an air compressor to blow any excess standing water out of the pipes. Go back to your hot water heater and use the drain valve to empty the heater. Keeping the hot water heater empty will protect the internal parts and heating elements from damage. WATCH OUT! Sometimes these water heaters don’t have a drain below them, meaning you’ll need to hook up some sort of hose to prevent flooding. Drain any water remaining in holding tanks. Flush toilets to remove as much water as possible from the tanks and bowls. If you have any stubborn water sticking around, consider adding antifreeze to prevent and freezing, expansion, and pipe bursts. You’ve cleared out the water, now you feel reasonably certain you don’t have to worry about that freezing. But what about the pipes themselves? Well, if you have the time you might want to see what you can do to prevent freezing pipes. If you have the time available, take a look at the building’s plumbing. The pipes of our buildings are like the veins of the house, pushing necessary water throughout the rooms. But when those freeze, a blockage can occur and all the sudden your home isn’t looking so good! Look for pipes outside of walls, windows, in unheated spaces or uninsulated. These pipes are going to be the ones most prone to freezing. Heads up, plastic pipes are more tolerant to freezing, but old copper or steel water pipes are prime targets. Look for any cracks in the walls, ceilings, for floors. These are unwelcome entry points for cold air. Get some caulk and fill those holes, you don’t want anything to do with the chilly (or downright freezing) outside. While you’re busy inspecting the exterior, look for any cracks outside. If you had to repair any inside, then you already know what comes next: caulk it! Fill any visible cracks with either calk or spray foam. On those pipes you noted as exposed or uninsulated, use insulation sleeves, foam pipe insulation etc. You don’t want any gaps in the insulation, any holes will allow the cold to get right to the pipe and damage it. Make sure there is some source of heat inside the building. Some recommend letting a faucet remain at dripping, this will allow any water still in the pipe to move freely, preventing the freeze. Hose bibs! These get forgotten often, unfortunately, which means they’ll crack and burst open in the middle of the night. That’s no good for anybody. Instead, drain the hose bibs and insulate with a cover. Then use the shutoff valve to shut off the bibs. If you follow all of that, well your property, home, hotel or hospital should be in great shape to make it through winter with no complications. Few things are perfect of course and the chance of a pipe bursting can mean a whole heckuva lot of damages if not caught quickly, so maybe go back and double check your work? Voila! You have winterized your pipes! You’ve identified which pipes might be prone to freezing and have taken the necessary precautions to prevent it! You’re now ready to survive through the winter. Nice. Well, we’ll see you next year! If you’re ready to plan your 2019 remodeling job, well we’re just the folks you’re looking for. Give us a call and we can give your bathrooms the makeover you’re craving. Wishing you and yours a very happy holiday from all of us here at American Bath Remodeling. Copyright © 2018 American Bath Remodeling, Inc. All Rights Reserved.